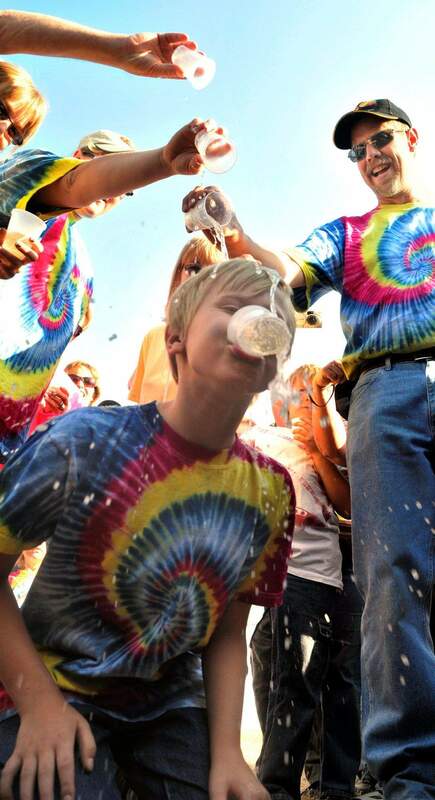 Nine-year-old Bobby Bradley is doused with sparkling cider by his sister, Samantha, left, his mother, Tami, center, and his father, Troy, during a ceremony Saturday held after his first solo flight in a hot-air balloon near Tome, N.M.
TOME, N.M.  Nine-year-old Bobby Bradley floated into history early Saturday, taking off solo in a hot-air balloon and landing perfectly about a half-hour later to become the youngest trained pilot to accomplish such a feat. Showing maturity and composure well beyond his years, Bradley proved any doubters wrong as he strategically touched down on a dirt road  exactly as his parents had instructed. Some among a small crowd gathered for the event then doused the boy with nonalcoholic champagne and silly string as he knelt to drink his celebratory glass. It was awesome. It was amazing. I loved it, he said. Absolutely perfect, is how his mother, Tami, described the landing. The boy took off to the cheers of more than 50 friends, family and classmates who gathered at 5 a.m. in Albuquerque to drive in a caravan to a remote field that was chosen for its lack of power lines and other potential hazards. Takeoff came shortly before 7 a.m., along with three other balloons whose pilots included a designated balloon examiner for the Federal Aviation Administration and a balloonist who helped make Bradleys special ultra-light craft. The boys flight lasted 26 minutes. Bobby is a fourth-generation balloonist and has been flying in them for more than half his life, with his parents and some of the sports most experienced and decorated pilots. He has nearly 30 hours of flight time with his father in a standard hot-air balloon. But he cant get his pilots license until hes 16, so his family and friends built the smaller balloon that is classified as an ultra-light aircraft to enable Saturdays solo flight. Both of his parents have been licensed pilots since they were teenagers. The two won the Americas Challenge Gas Balloon Race, one of the countrys biggest events in balloon racing, in 1998. Troy Bradley also helped pilot the first balloon to fly from North America to Africa and has set dozens of world records in ballooning. Two days before the landmark flight, his maternal grandmother Jan Stevenson  who sewed the panels of the blue, red and yellow balloon together  gave him a jacket his late grandfather Bob Stevenson used to wear, complete with all the ballooning pins he was so proud of. Although Bobby had planned to wear it for the flight, it was getting warm out by the time he took off so he carried it in his gondola, along with two beanie bears belonging to him and his sister that he said his father always takes with him when he competes in balloon races. I have to admit I was, she said.